Getting a new copier can be a scary moment. Signing a contact that lasts for years can be scary for someone who is starting a new business or who doesn’t know where the future will take them. It’s times like this that our used copiers in Chicago could be a great option for you. Our selection of used copiers is sure to satisfy your business needs and your budget. Used copiers can be a great solution for any business. They give you the ability to complete your office copying needs while keeping you free from long commitments. There is a lot of value to being on a copier lease, but we want to provide solutions that help a variety of different business needs. Our selection of used copiers can be the answer you’ve been looking for to solve your office copier and printing needs. There are some people that are scared of used copiers. They think that they will be doomed to break down sooner than other machines and that there will be no way to fix them. Nobody wants to be left with someone else’s problems. Luckily, that’s not a problem when getting a used copier from Copier Chicago. Our used copiers all come from responsible businesses who followed the rules of their leases. This means that they were kept in good condition and are ready for use. We also provide certain returns depending on how your lease is set up. 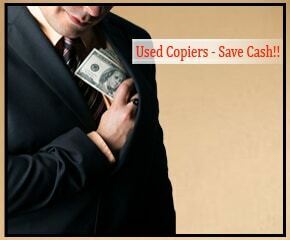 Give us a call at Copier Chicago to get the best deals on used copiers in Chicago.